Hello! 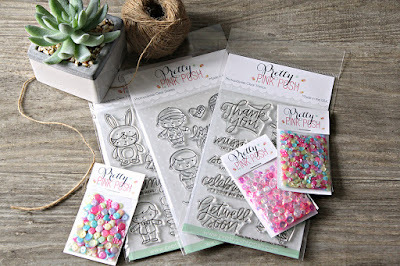 CardMaker Magazine has teamed up today with Pretty Pink Posh for a super fun blog hop showcasing some of their awesome products. 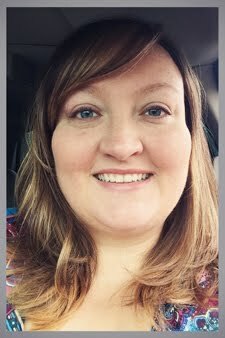 :) Hopefully you've reached my blog by way of Rebecca Keppel's blog, but if you'd like to start at the beginning of the hop, please click HERE. To create my mini-card, I started by first using one of the edge dies from the Stitched Notes on the top and bottom of a piece of white cardstock. 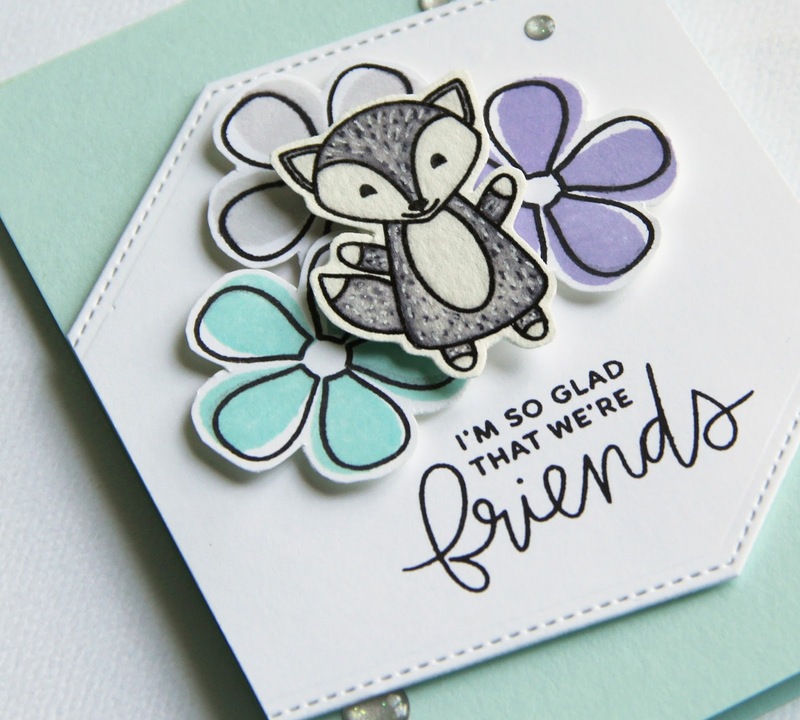 One of the sentiments from Friends Forever was then stamped in Versafine black ink onto the white die cut panel. Next, I stamped one of the fox images from Fox Friends in Versafine black ink onto watercolor paper, then heat set it with clear embossing powder. The image was then die cut and colored with Zig Clean Color markers and set aside to dry. I then stamped the tiny vase outline image from Friends Forever in Versafine black ink onto white cardstock in small circles to create the flowers. Next, I went back and offset stamped the solid images onto the flowers before fussy cutting them out. The sentiment stamped panel was adhered to a sea glass cardstock card base (3.5x5") with foam tape, and the flowers were adhered on top. To finish up, I adhered the fox to the card front and embellished with silver enamel dots. I love your card. The layers are just perfect! Color too! What a lot of great out-of-the-box ideas packed into one adorable card! Love the face on that little fox! Cute card and great idea; turning a vase into an adorable flower. Adorable card! Love your coloring and choice of colors! Makes me think of the fox that walked through my backyard. he didn't stop to wave though! Cute. Loved the angles you used. Like the design of the white piece. A cute idea using the flowers with the fox. Love the colors used on this cute card! The animals in their stamps are so cute. Nice card. Love your card! And love how you try to use stamps for other than their original use!! Very clever! So clever to use that vase stamp to build your flowers. Love it! I just ordered the edge dies. Can't wait to get my order. Thanks for sharing your lovely work and for a chance to win! Your card made me smile and I needed that today. Thank you. 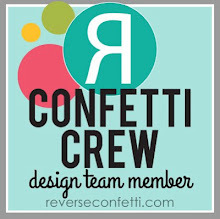 This is so CUTE and full of amazing ideas! cut the hexagon - very interesting & fun design. Very cute fox and love the creativity you displayed by using the vase to create a flower. Way too cute!! I love your design of your card!! Love your card and thanks so much for the tip on how to get the most from our stamps! I would never have thought to use a vase stamp to make a flower! You learn something new every day! TFS! Fabulous. I like the shape of the background panel and the clever way you made the flowers. I like the colors you chose for your adorable card. Cute little fox and adorable flowers! Great design with all the angles!! Great card! Love the colors and the design. Love the fox too! This card is too stinking cute! Your little fox, nestled in the flowers, is absolutely adorable! Sweetness to the nth degree! Great card. Love the flowers. Cute card and colors! What a great way to use the vase outline to create the flowers...love it! Love how you created the flowers. Brilliant idea and super adorable card! I love the pretty flowers and super cute fox!Absolutely adorable! Fabulous card and great out of the box stamping for making flowers from the vases. Love it! Love the soft pretty colors you used on your foxy card!! Very nice color combo! The little fox is darling. 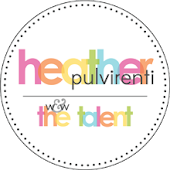 Heather, love your sweet card! Great design. Very creative. Love the vase idea for flowers. I too love ideas for re purposing for other occasions. Love it. Pretty card, I love your silver fox! Awesome hop! Your coloring of his fur is superb!! Omgee the way you used the vase to make flowers is so clever!!! Lovely card! So cute! Love the edges on here's! Super cute and fun card. Love your card front shape and how clever to make a flower from the vase outline! Liked the way the whole design of the card came together. Liked the way the whole card came together.